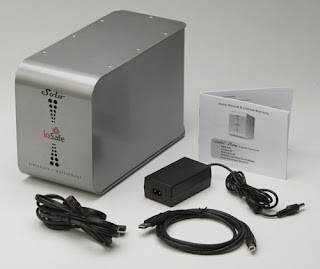 John Flucke's Blog - Ramblings of Dentistry's Technology Evangelist: ioSafe Review is Complete... Buy One! For the past month or so, I've been using and tinkering with the ioSafe USB Hard Drive. This device is like having an M1A1 Abrams Tank under your desk. You've never felt an external hard drive like this before. It feels sturdy... like it's an industrial product. Of course that's because this thing is made to survive almost anything mother nature can throw at it. It is waterproof to 10 feet for 3 days in fresh or salt water. It's also fireproof to 1550 degrees F for 30 minutes. The device is heavy, due to all its protective gear, and even comes with a connector for a cable lock. It also has pre-drilled holes on the base that allow you to bolt it down if you'd like to make sure it doesn't move during a disaster. Setup is a breeze. If you can plug in an AC cord and a USB cable, you're done! This is one of the smartest devices I've had a chance to review. I'm still continuing my usual meticulous backup routine and a portable hard drive still leaves the office with me and the day's data is on it. However, it is a huge addition to know the ioSafe is sitting in the office doing scheduled backups even when I'm not there. On Thursday when I left for the CDA, there were still patients being seen, radiographs and photos being taken, 3D scans being done. All of those were backed up in my absence and would have been there had any disaster happened. Kudos to the gang at ioSafe for this amazing product. As I type this, my feet are resting against the large shipping box marked "ioSafe" that arrived today. I'm installing one in my home this evening to keep all my photos and music secure from disaster. If you want to make sure you still have your stuff... buy an ioSafe. This device is highly recommended.